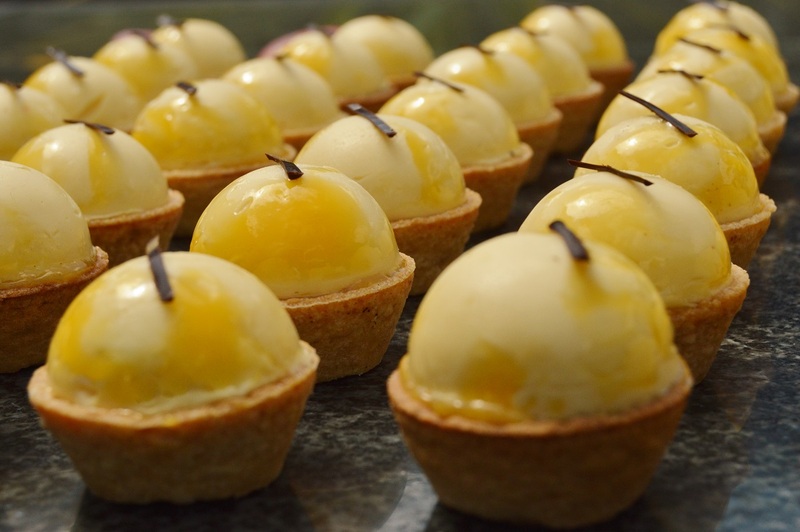 Inspired by a passion fruit pannacotta I had a few months ago, these are very simple tarts that I made for a friend’s birthday: the tarts have a full-on passion fruit flavour, a kick of rum-soaked peaches and the richness of white chocolate. They are also quite light treats as I have made them mainly with yoghurt. I have also made these with a mixture of yoghurt and whipped double-cream, making them even more luxurious. However, the yoghurt adds a lovely sour flavour which goes so well with the sweetness and the sharpness. Hemispherical silicone cake pop moulds, about 4-5cm diameter, are ideal here to freeze the filling, which then gets turned out and placed onto the pastry. These work equally well made in one deep pastry case, blind-baked: for speed, placing the domes in concentric circles around the top. Not at all as difficult as they might look! I made 40 of these tarts, but this is nowhere near as daunting as it might sound, as most of the components are made ahead of time, with the actual assembly of the tarts taking about 15 minutes. 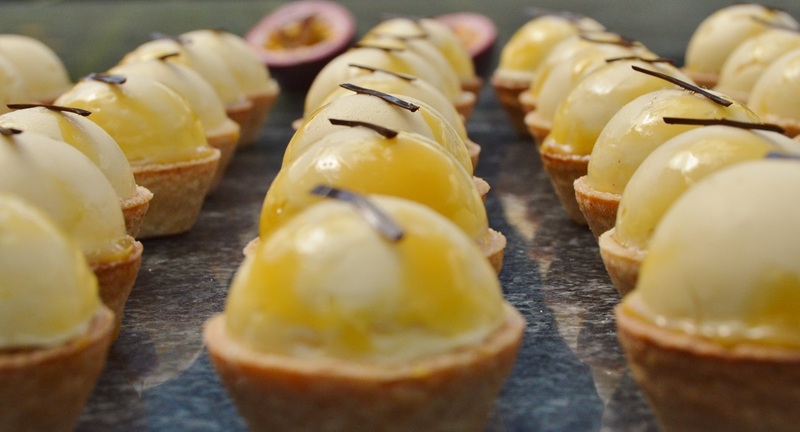 While you can scale down the ingredients, it is worth making a full amount of the domes, as they can sit in the freezer until you are ready to assemble the tarts, using just as few or as many as you want at a time: perfect for a very quick sweet treat if you have the tart cases to hand! 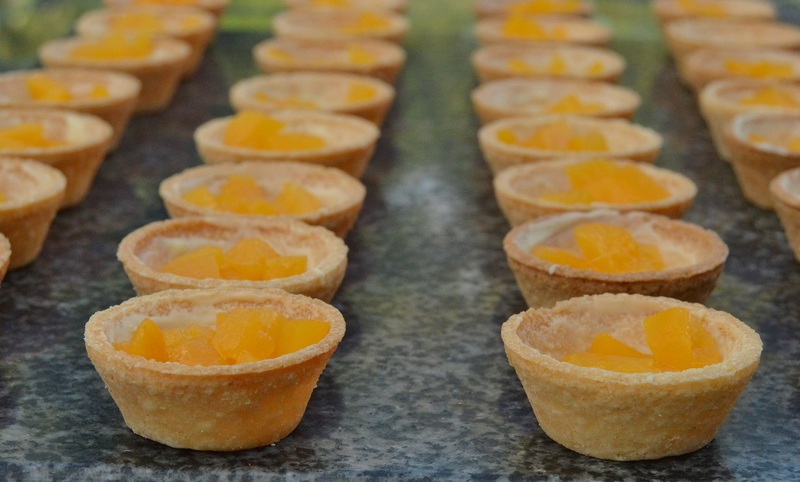 Once assembled, you need to leave the tarts in the fridge to allow the domes to defrost: they will hold their shape perfectly, taking on a soft, melt-in-the-mouth texture. The assembled tarts will remain crisp for a couple of days in the fridge. While I usually make my own pastry (I find it so therapeutic! 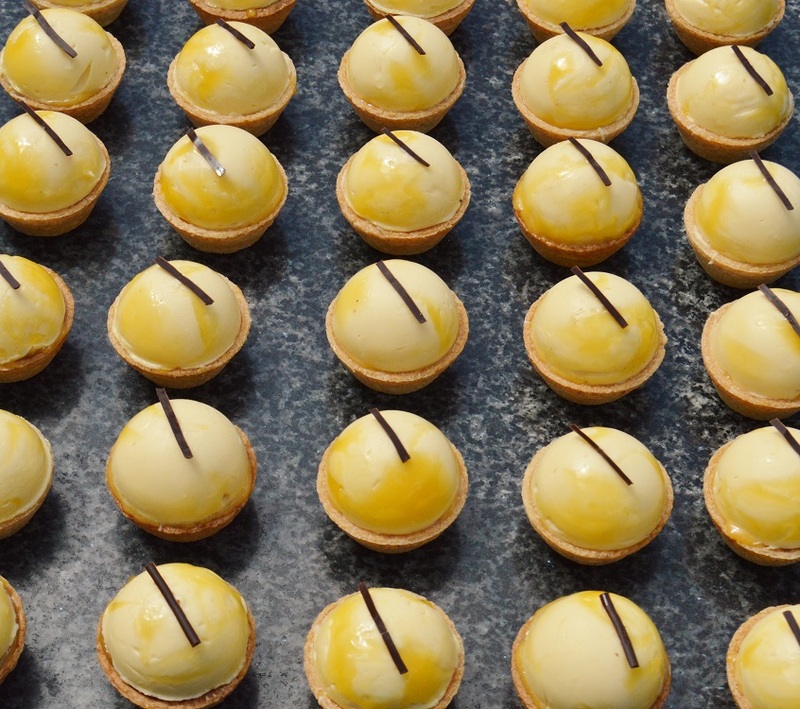 ), you can buy the pastry cases already blind-baked – in which case use the all-butter shortcrust pastry cases. *if you can’t get passion fruit curd, use any quality curd. (1) Place a little curd in the base of each mould and roughly spread it around the inside with your finger: don’t cover the inside perfectly as you want to get a random marbling effect when you turn them out. 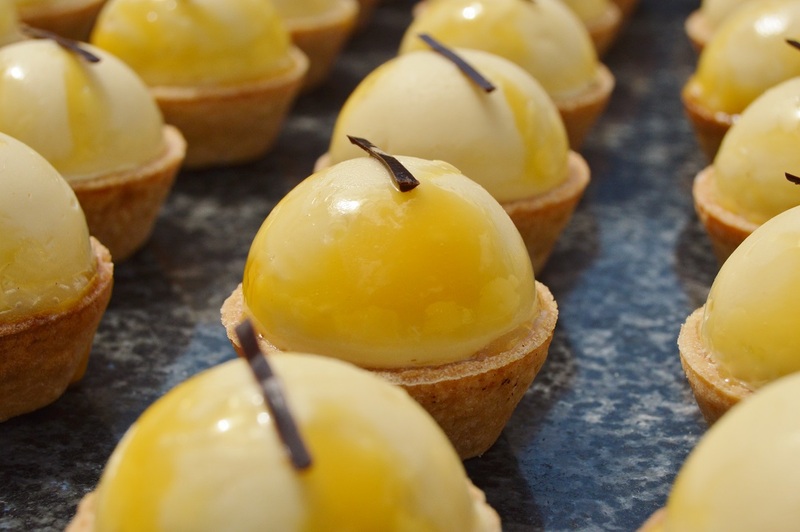 (2) Make the domes: whisk the yoghurt, passion fruit juice and the passion fruit curd together to give a smooth mixture. Squeeze the excess moisture out of the gelatine and add to the hot water, stirring until it has fully dissolved. Stir into the passion fruit and yoghurt mixture. Whisk in the chocolate until it has been incorporated. (3) Spoon or pour into the moulds, coming right up to the top. Level off with a palette knife or a ruler if needed. Freeze until firm. (4) At least day or two before, mix the peaches with the rum, place in an airtight container or jar and leave to macerate. (5) Brush a little melted chocolate around the inside of each pastry case – it is easiest using your fingertip! Refrigerate until the chocolate has set: this will give a thin, crisp layer of chocolate so that the peaches, rum and the rest of the filling don’t make the pastry go soft. This is optional, but I like the subtle chocolatey crispness it gives. 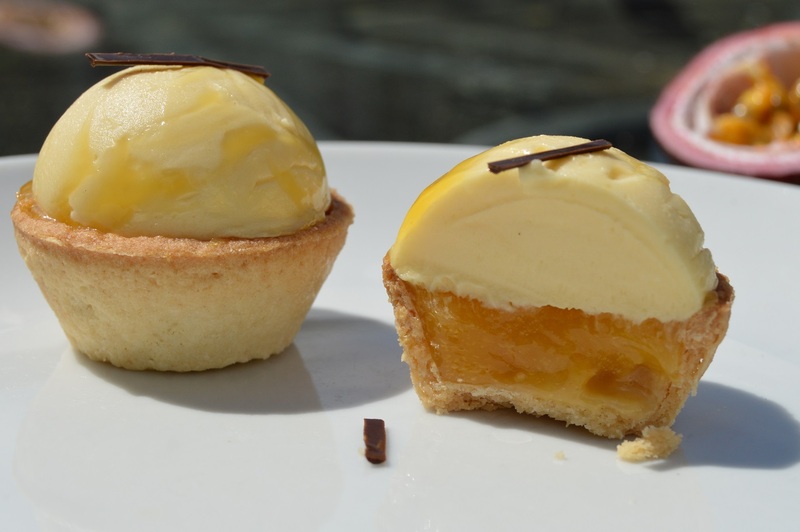 (6) To assemble the tarts, place a few of the peach pieces into the base of each tart, but without too much of the rum (the peaches will already have taken on a lovely rummy flavour!). However, you won’t waste the rum: mix it with the passion fruit curd. (7) Add a small amount of the passion fruit curd on top. 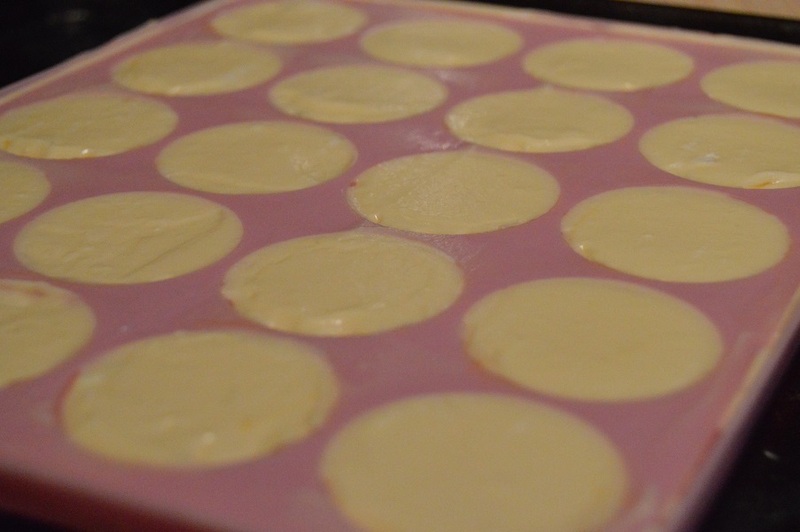 Remove the filling from the silicone moulds and place on top of the tarts, very lightly pressing down so that it stays in place. (8) Refrigerate for at least a couple of hours before serving. You can place a little chocolate on top or leave the tarts as they are. thank you very much. They did seem to go down will with people which is always great to see – and I enjoyed eating the “tester” tarts!! These look absolutely amazing…all lined up with a strip of chocolate on top. Although they look quite difficult to make, having read your clear instructions they are clearly quite straightforward. thank you Angela. Ah yes, I love bakes that look so complicated but actually turn out to be relatively straightforward. Great recipe with great photographs!! !